Sufism (from Arabic (صوف), Suf meaning "wool") is a mystical tradition of Islam dedicated to experiencing Allah/God as the epitome of divine Love. Sufis can be associated with Shi'a Islam, Sunni Islam, other currents of Islam, or a combination of multiple traditions. Emerging duing the eighth century C.E. in the Middle East, though having earlier precedents, Sufism subsequently developed into several different orders known as Tariqas. The most famous of these orders is the Mevlevi tradition associated with the poet and mystic, Jalal al-Din Muhammad Rumi. Sufis believe that excessive rationalism blocks human understanding of God's immersive and loving nature. Consequently, they focus on directly experiencing God through ecstatic practice in order to efface the obstructing self. Sufis have endured persecution over the years due to their unconventional and controversial approach to Allah, which has been perceived by some to be blasphemous. In recent times, the teachings of Sufism have spread to the West and Sufi writings have become best-selling works. Whirling Dervishes perform near the Mevlevi Museum in Konya, Turkey. The conventional view is that the term originates from Suf (صوف), the Arabic word for wool, referring to the simple cloaks that the early ascetics wore. However, not all Sufis wear cloaks or clothes of wool. Another possible etymology is that the root word of Sufi comes from the Arabic word safa (صفا), meaning "purity." This approach places the emphasis of Sufism on purity of heart and soul. Another suggested origin is from "Ashab al-Suffa" ("Companions of the Veranda") or "Ahl al-Suffa" ("People of the Veranda"), who were a group of Muslims during the time of the Prophet Muhammad that spent much of their time on the veranda of the Prophet's mosque devoted to prayer. Sufism is said to have originated during the time of Prophet Mohammad (seventh century C.E.). Almost all traditional Sufi orders trace their "chains of transmission" back to the Prophet via his cousin and son-in-law Ali ibn Abi Talib (except the Naqshbandi order which traces its origin to caliph Abu Bakr). Each order believes that Sufi teachings were passed on from teacher to student through the centuries. Some scholars argue that Sufism evolved from an interiorization of Islam, such as Louis Massignon who states: "It is from the Qur’an, constantly recited, meditated, and experienced, that Sufism proceeded, in its origin and its development." Sufism may also have emerged from the practice of Muslim asceticism. People of ascetic temperaments were found throughout Muslim communities early in the history of Islam. These ascetics focused on introspection and maintained a strict control over their life and behavior. They followed a lifestyle of modesty, temperance, contentment and the denial of luxury. Their practices included fasting, wearing light clothing in the depths of winter, or withdrawing themselves from the world. Other theories have been suggested for the origins of Sufism, which link it to outside non-Muslim influences. If early Sufism arose out of the practice of asceticism—the turning away from worldly life to concentrate on prayer to Allah—then it likely resulted in being limited to a small number of devoted practitioners. However, by the middle of the ninth century, Sufi mysticism started to burgeon. One major figure and catalyst in its growth was the female mystic Rabiah al-Adawiyah (died 801), who emphasized the absolute love for Allah above everything else. The shift of Sufism from asceticism to divine love captured the attention of the masses and elites, and soon Sufism began to flourish in Baghdad spreading then to Persia, Pakistan, India, North Africa, and Muslim Spain. Figures such as Uwais al-Qarni, Harrm Bin Hian, Hasan Ul-Basri and Sayid Ibn Ul Mussib are regarded as the first mystics in Islam. Rabia was a female Sufi and known for her love and passion for God. From 1200-1500 C.E., Sufism experienced an era of increased activity in various parts of the Islamic world. 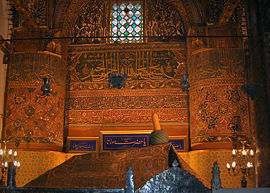 This period (especially the thirteenth century) is considered to be the "Golden Age" of Sufism. At this time, many of the major figures in the history of Sufism were alive and writing their monumental classics of Sufi literature and poetry. The Sufis dispersed throughout the Middle East, particularly in the areas previously under Byzantine influence and control. This period was characterized by the practice of an apprentice (murid) placing himself under the spiritual direction of a Master (shaykh or pir). Schools were developed, concerning themselves with the topics of mystical experience, education of the heart to rid itself of baser instincts, the love of God, and approaching God through progressive stages (maqaam) and states (haal). The schools were formed by reformers who felt their core values and manners had disappeared in a society marked by material prosperity that they saw as eroding the spiritual life. Additionally, many Sufi brotherhoods (turuq) flourished with lodges and hospices that became places for practicing Sufis and other mystics to stay and retreat. One of the first Sufi orders was the Yasawi order, named after Khwajah Ahmed Yesevi in modern Kazakhstan. Another order, called the Kubrawiya order, originated in Central Asia. The most prominent Sufi master of this era is Abdul Qadir Jilani, the founder of the Qadiriyyah order in Iraq. Others included Jalal al-Din Muhammad Rumi, founder of the Mevlevi order in Turkey, Sahabuddin Suharwardi in Asia minor, and Moinuddin Chishti in India. As Sufism grew and as the Mongol empire expanded from Persia through Central Asia, Sufis absorbed ideas from local people who followed such ancient traditions as Zoroastrianism, Vedanta, Gnosticism, Buddhism, or Shamanism. Thus Sufism came to bridge gaps between the Muslim population and rulers and the local people they ruled over. In the modern period, Sufism has started to reemerge, and has tens of millions of followers in Central Asia, Southeast Asia, and West Africa; hundreds of millions more across the world follow Sufi ways. In recent times, Sufism has spread to the West and the writings of Sufi masters and poets have become best-selling works. Additionally, there has been a growth of non-traditional Sufi movements in the West. Some examples are Universal Sufism movement, the Mevlevi Order of America, the Golden Sufi Center, the Sufi Foundation of America, and Sufism Reoriented. Sufis understand the Prophet Mohammed’s saying, “God was, and nothing was Him” to mean that God’s existence is supreme to all others. God alone possesses reality and provides the reality to everything else in the world (Chittick, 2000, p. 12). People who sense this special perception within themselves and who work to transcend ordinary human constraints can further develop their minds to “know” God (Hardin, 1973). The ninth-century mystic Nubian Dhu al-Nun al-Misri clearly expressed what was to become the backbone of Sufi philosophy by saying, “Let him direct his soul to the greatness of God, for then it will dissolve and become pure. Whoever regards the power of God, his own power goes away, for all souls are poor next to his awesomeness” (Melchert, 1996). His disciple, Al-Kharraz, (890 – 891 C.E. ), was the first to speak of f’ana (annihilation) and baqa (remaining) to describe how Sufis sought to lose consciousness of their own self to properly live in full contemplation of the divine’s existence (Melchert, 1996). Building on these notions, Sufism developed several key doctrines including Wahdat (meaning "Unity"), which affirms the Oneness of Allah (tawhid), and Tawakkal (meaning "absolute trust in God"). The former doctrine is predicated on the belief that all phenomena are manifestations of a single reality called Wujud (being), or al-Haq (Truth, God). The essence of being/Truth/God is devoid of every form and quality, and hence unmanifested, yet it is inseparable from every form and phenomenon either material or spiritual. It is often understood to imply that every phenomenon is an aspect of Truth and at the same time attribution of existence to it is false. The chief aim of all Sufis is to let go of all notions of duality, including the individual self and realize this divine unity. In this way, Sufis seek to directly connect with the divine. Junayd was among the first theorist of Sufism; he concerned himself with ‘fanaa’ and ‘baqaa’, the state of annihilating the self in the presence of the divine, accompanied by clarity concerning worldly phenomena. The Sufis believe that the highest form of human love is the pure love for the Divine. Humans can achieve this love if they give themselves entirely to the Allah's will (Abdin, 2004). Sufis consider love for family, friends, material goods, or even Paradise all to be distractions from the love of God (Chittick, 2000). The heart of a believer should be so overflowing with God’s love that there is no other room for any other emotion in it (Abdin, 2004). Affirming this sentiment, the great female Sufi Rabi’a Al Adawiyya said, “I love God: I have no time left in which to hate the devil.” (Abdin, 2004). Love allows the believer to seize the spiritual beauty of God that is present in all things, and therefore love God in all things and love all things through God (Abdin, 2004). Remembrance of Allah, or dhikr, forms the backbone of Sufi practices (Waines, 2003). Repeating the name of God is a form of dhikr, which is thought to be a direct manifestation of the divine on a human level. Additionally, poetry, dancing and music are devotional tools used by Sufis to remind the seeker of God’s presence. These practices were also used to heighten awareness and concentration of one’s inner mind, and were a central part of Sufism from the early days. As Sufi devotional practices evolved over the centuries, a more elaborate system developed that aimed to facilitate moving the seeker through seven stages of consciousness (Semaan, 1979; Safi, 2003). In the first stage, Sufi followers were to give themselves over to service of their brethren and to following the law. In the second stage, Sufis were to practice righteous actions as prescribed by the holy Qur'an, and the further rigors of asceticism. Through these practices, Sufis aimed to be imbued with the knowledge of an inner light. The third stage sought the experience of ecstasy in the presence of God moving towards the sixth stage of finding union with God. Finally, in the seventh stage, the Sufi reaches annihilation—the self is extinguished and no longer exists independently from God (Semaan, 1979). The one who has reached the pinnacle of these stages is said to be a Mu’min, or pure believer, who can communicate directly with God (Safi, 2003). At the seventh stage, the Sufi is said to see everything as a manifestation of God and is stripped of all notions of culture, race and ideology (Safi, 2003). Virtually all Sufis also distinguish Lataif-e-Sitta (The Six Subtleties) that designate the spiritual centers of sensory perception that lie dormant in an individual (i.e. Nafs, Qalb, Ruh, Sirr, Khafi & Akhfa). Sufis seek to activate and awaken these centers. The purification of the elementary passionate nature (Tazkiya-I-Nafs), followed by cleansing of the spiritual heart so that it may acquire a mirror-like purity of reflection (Tazkiya-I-Qalb) and become the receptacle of God's love (Ishq), illumination of the spirit (Tajjali-I-Ruh) fortified by emptying of egoic drives (Taqliyya-I-Sirr) and remembrance of God's attributes (Dhikr), and completion of journey with purification of the last two faculties, Khafi and Akhfa. Through these "organs" or faculties and the transformative results from their activation, the basic Sufi psychology bears some resemblance to the schemata of kabbalah and the tantric chakra system. Muraqaba (Persian: Tamarkoz) is the word used by many Sufis when referring to the practice of meditation. The Arabic word literally means "to observe, guard or control one's thoughts and desires." In some Sufi orders, muraqaba may involve concentrating one's mind on the names of God, on a verse of the Qur'an, or on certain Arabic letters that have special significance. Dhikr is the remembrance of God commanded in the Qur'an for all Muslims. To engage in dhikr is to have awareness of God according to Islam. Dhikr as a devotional act includes the repetition of divine names, supplications and aphorisms from hadith literature, and sections of the Qur'an. More generally, any activity in which the Muslim maintains awareness of God is considered dhikr. It is interesting to note that the practice of Muraqaba and Dhikr have very close resemblance with the practices of the Jewish mystics. Muraqaba is very similar to the Merkavah practice, which is one of the meditations used by Kabbalists to attain higher states of consciousness. Kabbalists also use a practice called Zakhor which in Hebrew literally means remembrance. Zakhor serves the same purpose in Kabbalah as Dhikr serves in Sufism. Another thing to notice here is that there is not only similarity in practice but also a strong similarity in the spelling and sounding of the words in Sufism and Kabbalah. This may imply that the Sufi mystical system has its origins in Judaism and its mystical tradition the Kabbala. Some Sufi orders engage in ritualized dhikr ceremonies, the liturgy of which may include recitation, singing, instrumental music, dance, costumes, incense, meditation, ecstasy, and trance. (Touma 1996, p.162). Qawwali is a form of devotional Sufi music common in Pakistan, North India, Afganistan, Iran and Turkey. It is known for its secular strains. Some of its modern-day masters have included Nusrat Fateh Ali Khan and the Sabri Brothers. Sema refers to Sufi worship practices involving music and dance. In Uyghur culture, this includes a dance form also originally associated with Sufi ritual. The Mevlevi order, founded by Rumi, became famous for their whirling dance (El-Zein, 2000). 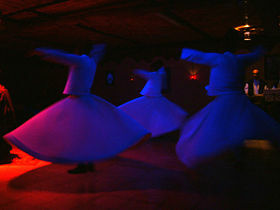 Along with anticipation and anguish, the dance of the whirling dervish symbolizes the exhilaration that comes from the search for divine love (El-Zein, 2000; Tell, 2002). The whirling movements of the dervishes are performed to the sound of a reed and drum; the intensity of the movement mounts as the Sufis attempt to transcend their body and rational consciousness (Tell, 2002). Their dance is said to be symbolic of the universal cosmic dance that was begun and is sustained by the divine music of love (And, 1977; Omaima, 1994). Khalwa refers to a form of retreat, once widespread but now less common. A khalwa may be prescribed by the shaykh (spiritual advisor) of the murid or talib (student). Muslims believe that most of the prophets, and also Maryam (Mary) the mother of Issa (Jesus), lived in some form of seclusion at some point in their life. Muhammad, for example, used to retreat to the cave where he received his first inspiration—but had been going there for many years prior to his meeting with the angel Gabriel. Similar examples include Moses' going into seclusion for 40 days in a cave in Mt. Sinai. Mary was in seclusion in the Jewish temple for a year, where only Zakariya was permitted to see her. Sufism has produced a large body of poetry in Arabic, Turkish, Persian, Kurdish, Urdu, Punjabi and Sindhi. Its poetic gems can be found in every major Islamic culture and literature. Notable Sufi writers include Ibn al-Farid, Ibn Arabi, Jalal al-Din Muhammad Rumi, Farid Ud-Din Attar, Abdul Qader Bedil, Bulleh Shah, Amir Khusro, Shah Abdul Latif Bhittai, Sachal Sarmast and Sultan Bahu. A significant part of Persian literature comes from Sufism, which produced great works of poetry such as the Walled Garden of Truth, Rubaiyat of Omar Khayyam, the Conference of the Birds and the Masnavi, all of which contain teachings of the Sufis. It was around 1000 C.E. that the early Sufi literature, in the form of manuals, treatises, discourses and poetry, became the source of Sufi thinking and meditations. [However], The allegorical and often abstruse language used by Sufis in their texts when interpreted by unqualified people opens avenues for many misunderstandings. eg. The concept of divine unity Wahdat-ul-wujood which critics consider equivalent to pantheism and therefore incompatible with Islam. Sufi masters in many of their introductory texts caution aspirants from reading and interpreting texts by themselves. They hold that the subject can only be taught by a master to a student under strict guidance and supervision owing to its delicate nature. Sufis do not define Sufism as a school of legal jurisprudence (or Madhab). Often what distinguishes a person as a Sufi is their association with a Sufi order. Among the oldest and most well known of the Sufi orders (tariqas) are the Qadiri, Chisti, Oveyssi, Shadhili, Jerrahi, Naqshbandi, Nimatullahi, Mevlevi and the Ashrafi. Classic Sufi tariqas insist on adherence to one of the four Madhabs of Fiqh and one of the two orthodox schools of Aqida. In this sense, traditional practitioners of Sufism do not see it as a sectarian group but just as a form of training necessary to cultivate spirituality and Ihsan in their lives. Sufism was traditionally considered the systematization of the spiritual component of Islam. It dealt with matters of the heart (just as Fiqh dealt with the body and Aqida dealt with the intellect). Many of the greatest Islamic scholars wrote treatises on the subject (eg. Al-Ghazali's ihya ulum-aldeen (احياء علوم الدين), Imam Nawawi's Bustan al-Arifeen etc.). Almost all the famous Sufi masters of the Islamic Caliphate times were also experts in Sharia and were renowned as people with great Iman (faith) and excellent practice. Many were also Qadis (Sharia law judges) in courts. They held that Sufism was never distinct from Islam and to fully comprehend and live correct with Sufism one must be a practicing Muslim obeying the Sharia. Many of the traditional scholars who were part of famous Islamic institutions (eg. Al-Azhar) like Ibn Ata'illah were Sufi masters. Even today, many of the traditional Islamic universities like Al-Azhar endorse Sufism as a part of the religion of Islam. However, Sufism emphasizes non-quantifiable matters (like states of the heart). The authors of various Sufi treatises often used allegorical language which could not be read by an unknowledgeable person to describe these states (eg. likened some states to intoxication which is forbidden in Islam). This usage of indirect language and the existence of interpretations by people who had no training in Islam or Sufism led to doubts being cast over the validity of Sufism as a part of Islam. Also, some Sufi groups emerged that considered themselves above the Sharia and discussed Sufism as a method of bypassing the rules of Islam in order to attain salvation directly. This was disapproved of by traditional scholars. An example of such a deviant sufi was Abu Hilman. One of the most vocal critics of such deviations from the Islamic creed was Ibn Taymiya. The relationship between orthodox Islam and Sufism is complicated due to the variety of Sufi orders and their histories. According to the followers of Sufism, early scholars of Islam had positive attitudes towards Sufism. For example, Al-Ghazali defended Sufis as true Muslims. Later, there were some scholars who considered some aspects of Sufism heresy. Eventually puritanical Muslims attacked Sufis, saying their poetry and music were infections from Christianity and Hinduism and were antithetical to the principles of Islam (Dalrymple, 2004). The poetic raptures of Sufis were also considered suspect; at times, they were misinterpreted as insane ravings or even as blasphemy (Waines, 2003). Some Sufis were executed for their preaching; other Sufis saw their shrines destroyed; and still others were forced underground in countries like Saudi Arabia, where mysticism and the worship of saints are labeled as apostasy (Khan, 2005). Authorities expelled Abu Sulayman al-Darani from Damascus when he said he had seen and heard angels (Melchert, 1996). Abu Yazid was also forced into several years of exile from the city of Bastam after he claimed that, like Muhammad, he had ascended to the heavens (Melchert, 1996). Abu Hamzah recognized the voice of God in the cawing of a crow, for which authorities expelled him from Tarsus (Melchert, 1996). The controversy surrounding Sufism is perhaps best exemplified by Mansur al-Hallaj, who identified himself by one of the names of Allah—‘Ana Al-haqq,’ which means “I am the truth, I am the Reality or I am God.” These words had him branded as a blasphemer, and authorities in Baghdad ordered him to execution (Chittick, 2000; Tell, 2002; Waines, 2003; Abdin, 2004). Mansur al-Hallaj's statement is indicative of his intensity love of God, which reached its utmost limit when he realized that nothing but God existed (Chittick, 2000; Tell, 2002). The Sufi poet Rumi explained al-Hallaj's controversial statement this way: If al-Hallaj'shad said, “You are God and I am the servant,” that would have created duality by reaffirming his own existence. If Hallaj had said, “He is the Real,” that too is duality, for there can’t be “He” without “I.” Hence, Hallaj said, “I am the Real” to acknowledge other than God, nothing else existed. Rumi writes, “Hallaj had been annihilated, so those were the words of the Real” (Chittick, 2000, p. 17). While critics have thought of Sufism as a belief system that is alien to Islam, supporters of Sufism have argued that its tradition is in fact grounded in three themes that repeatedly appear in the Qu’ran, which are “submission” (Islam), “faith” (Iman), and “doing the beautiful” (Ihsan). Sufism takes “doing the beautiful” as its especial domain, which is based on submission and faith (Chittick, 2000). ↑ Louis Massignon, Essai sur les origines du lexique technique de la mystique musulmane (Paris: Vrin, 1954), 104. ↑ A number of scholars perceive influences from pre-Islamic and non-Islamic schools of mysticism and philosophy on Sufism such as Gnosticism, Judaism, and Hinduism. The Persian Sufis Retrieved June 3, 2008. ↑ See Qawwali origins and Origin and History of the Qawwali, Adam Nayyar, Lok Virsa Research Centre, Islamabad, 1988. Retrieved June 3, 2008. ↑ Abu Hilman Retrieved June 3, 2008. ↑ For a detailed essay on the role that Sufism plays in traditional Islam, please refer to Place of Tasawwuf in traditional Islam Retrieved June 3, 2008. Abdin, A. "Love in Islam." European Judaism, 37 (2004), 92-102. Chittick, W. Sufism: a Short Introduction. Oxford: Oneworld Publications, 2000. Dalrymple, W. "The ecstasy of God’s dancers." New Statesman, 133, (2004), 22-25. El-Zein, A. "Spiritual consumption in the United States: the Rumi phenomenon." Spiritual Islam and Christian-Muslim Relations, 11 (2000), 71-86. Hardin, N. "Doris Lessing and the Sufi way." Contemporary Literature, 14 (1973), 565-581. Khan, A. "The path ahead." Maclean’s, 118 (2005), 38-39. Loutfy, N., and G. Berguno. "The existential thoughts of the Sufis." Existential Analysis: Journal of the Society for Existential Analysis, 16 (2005), 144-155. Melchert, C. "The transition from asceticism to mysticism at the middle of the ninth century C.E." Studia Islamica, 83 (1996), 51-70. Omaima, A. "Abrogation of the mind in the poetry of Jalal al-Din Rumi." Alif: Journal of Comparative Poetics, 14 (1994), 37-63. Safi, O. Progressive Muslims: on justice, gender and pluralism. Oxford: Oneworld Publications, 2003. Semaan, K. "Islamic mysticism in modern Arabic poetry and drama." International Journal of Middle East Studies. 1979, 517-531. Tell, C. '"A poet and a mystic: Jalaluddin Rumi." Social Education, 66 (2002), 204-210. Waines, D. An Introduction to Islam. Cambridge: Cambridge University Press, 2003. White, C. "Sufism in Medieval Hindi literature." History of Religions, 5 (1965), 114-132. This page was last modified on 26 October 2015, at 14:20.